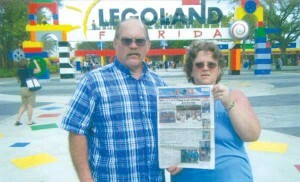 Theresa and Timothy Hargreaves, of Spencer Township, recently visited Legoland, in Winter Haven, Florida, and got a photo taken of them with their favorite newspaper—the Post! Legoland looks like a fun place to be. Thanks for sending us your photo! Take a Post on vacation with you and get a photo. Send it to us at news@cedarspringspost.com or drop it off at our office at 36 E. Maple in Cedar Springs.